FBN's Rich Edson breaks down highlights of President Obama's speech on the economy. President Barack Obama, in what the White House described as a major speech on the economic state of affairs in the U.S., made no significant new policy announcements, instead saying broadly he will focus on initiatives that help the plight of the struggling middle-class. The president blamed political gridlock – specifically Congressional Republicans – for stalling many of his administration’s economic proposals. “With an endless parade of distractions, political posturing and phony scandals, Washington has taken its eye off the ball,” the president said during a speech at Knox College in Galesburg, Ill., the site of his first major speech on economics eight years ago. The White House, ahead of the address, said the president hopes through Wednesday’s speech to shift the focus away from partisan bickering and toward bi-partisan solutions. Speaking broadly on several areas of the economy, Obama said he would focus on bringing back manufacturing jobs to the U.S.
“Over the past four years, for the first time since the 1990s, the number of American manufacturing jobs hasn’t gone down; they’ve gone up. But we can do more. 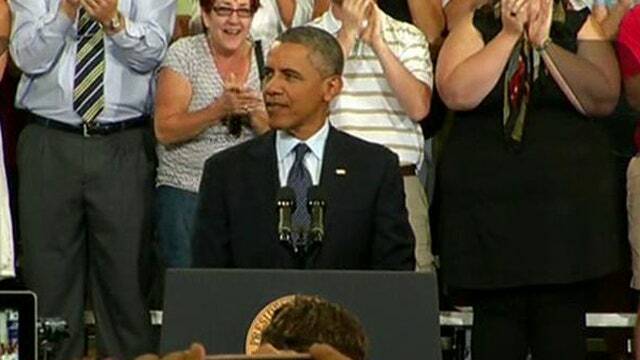 So I’ll push new initiatives to help more manufacturers bring more jobs back to America,” Obama said. The president also said his new economic focus would target infrastructure improvements. Obama added: “The businesses of tomorrow won’t locate near old roads and outdated ports; they’ll relocate to places with high-speed internet; high-tech schools; systems that move air and auto traffic faster, not to mention get parents home to their kids faster. We can watch that happen in other countries, or we can choose to make it happen right here, in America. With polls showing American disapproval of Congress at an all-time high, Obama said political gridlock in Washington, D.C., has blocked proposals such as immigration reform, which the president said would have a positive economic impact totaling more than $1 trillion. Obama said he would his administration will push for education programs that will train Americans for changes in the global workforce. “If you think education is expensive, wait until you see how much ignorance costs in the 21st century. If we don’t make this investment, we’ll put our kids, our workers, and our country at a competitive disadvantage for decades,” he said.